Low cost index funds outperform market averages. 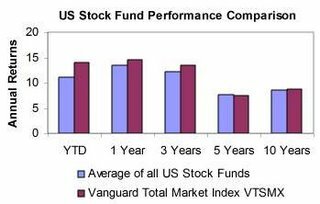 The chart below compares the returns of all US stock funds and the Vanguard Total Market fund as of 11/17/06. The 3, 5 and 10 year annual returns for "all" mutual funds are actually overstated. Each year between 3% and 15% of funds go out of existence (end and return money to investors or merge into another fund). 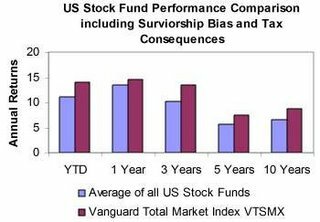 These are typically the lower performing funds (otherwise why would they go out of business) that if included would bring the average down and make the relative performance of the index funds even better. Most of the funds in the average are actively managed with higher turnover than index funds. 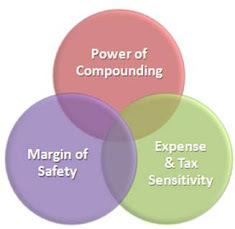 Turnover causes short and long term capital gains and their associated tax consequences. 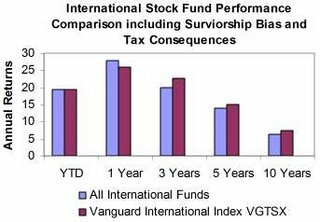 The chart below conservatively estimates the impact of survivorship bias and taxes and compares the returns. Did you ever hear a "stock pickers" rational for picking a stock? Have you heard the "efficient market theorists" say you can get the same (or better results) by throwing darts at a newspaper? Well, the reality is closer to the dart thrower's version, but not because the markets are efficient - because the future is unpredictable. Below is a list of just of few of the risk factors that will determine a stock's future price. How many of them do you think are predictable? The quatifiable stuff - discounted cash flows and dividend discount models, liquidation value, going concern value - those are easy, but provide just a portion of the information you need.